ASPIRE EVO is the world's first tool for modifying a voice's breathiness independently of its harmonic content, allowing you to match a vocal quality to a performance style by decreasing or increasing a voice's natural breathiness. 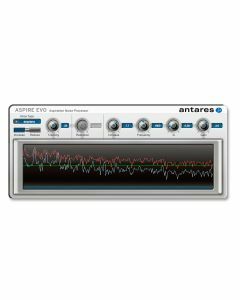 ASPIRE EVO analyzes a vocal in real time and separates the aspiration noise (breathiness) from the harmonic content. It then allows you to adjust the amount of aspiration noise, and affect its character independently by applying a Parametric EQ to the noise component. ASPIRE EVO also includes a real-time display that lets you visualize the effect of the aspiration noise processing. Whether reducing a bit of vocal rasp or adding a bit of smokiness, ASPIRE EVO allows modification of the amount and quality of a voice's breathiness, or aspiration noise, without otherwise affecting the vocal's harmonic characteristics. Quite simply, ASPIRE EVO analyzes a vocal in real time and separates the aspiration noise (breathiness) component from the harmonic content. It then allows you to either increase or decrease the amount of aspiration noise, as well as letting you affect the character of the aspiration noise by applying a parametric EQ to the noise component. Aspiration noise presents itself in a variety of ways, from a subtle bit of breathiness to a full-blown rasp. Of course, whether it's a problem or not depends on the amount of noise and the style of a performance. A whole lot of roughness that would work well for screaming punk or roots blues might well be a problem for mainstream pop or a smooth ballad (of course, it also might not). Up to now, there wasn't much you could do about it. Now, with ASPIRE EVO, there is. Aspire requires an iLok (not included). Windows 7 to 10. as required by your version of Pro Tools. Windows 7 to 10 as required by your host. Pro Tools 7.x â€“ 10.x.